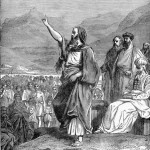 Moses was the greatest figure in the creation of Judaism. That is why we call him Moshe Rabbenu – Moses our Teacher. Maimonides calls him the greatest of all the prophets; the section about Moses in the Rambam’s Thirteen Principles is the longest of the whole document. Yet in the sidra which we read in the week of his birthday and his Yahrzeit, his name is omitted. Further, no-one knows his burial place, and the Pesach Haggadah does not mention him apart from an incidental quotation. Many theories explain the omission of God from the Book of Esther, but perhaps the best is that the Divine Presence is evident at every turning point in the story and therefore God is there even if not by name. Similarly with Moshe Rabbenu. He is there wherever we look in Judaism, even when not specifically named. His teaching breathes his spirit, even when not quoted b’shem om’ro. Any view of Moshe Rabbenu requires superlatives. Ahad Ha’Am has a famous essay in which he asks: “What, essentially, was Moses?” He proceeds to examine all the epithets that history accords him (military hero, statesman, lawgiver, etc.) finally reaching the conclusion that (as the Rambam had already insisted) Moses was a prophet. All very impressive, but because Ahad Ha’Am lived so many decades ago he could not have shared the extra assessment of our generation – that Moshe was great because he came in from the cold as a ba’al teshuvah returning to his roots. The erstwhile outsider sees with greater perspective. He is free from the hang-ups of the insider. He is driven by a passion. He knows the ways and idiom of the rulers who will be crucial to the task. His broad experience is useful. His willingness to leave the palace to be with his people intrigues and inspired them. All this is part of the uniqueness of Moses. This entry is filed under Articles, Leaders & Leadership, Parashah Insights, T'tzavveh.